If you're a yin personality with a jonesing for a meaningful tattoo, explore the fluid pairing of a water and moon illustration. 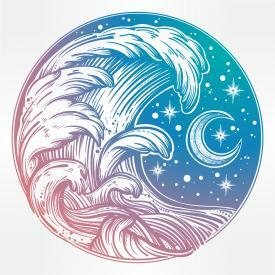 Water-moon tattoos are trendy body ink, from line drawings to full-blown technicolor paintings. Both of these free downloadable and printable flash water and moon tats can be obtained by following Adobe printable guidelines or using your favorite PDF program. Water moon designs can convey a number of different feelings, depending on the design. A moon made of water is a popular choice -- curling, splashing waves curve around to create a crescent moon. The curve mirrors the circulation in the body that gives people life, as well as the flowing cycle of birth, death and rebirth at the heart of many spiritual traditions. The easily identified image is compact enough for an isolated area such as the back of a shoulder or the top of a foot. 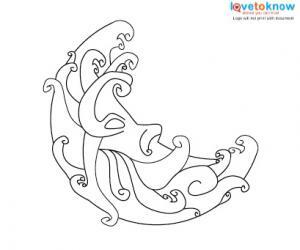 A crescent moon made of waves works in all-black lines or in full color, typically heavy on the blue. Try one encircling your navel, maybe with a hint of the moon's "face" in profile to define the subject. Moons are dramatic and romantic images as the centerpiece of a full back or inner arm. A stormy night with a full moon shining over the tossing waves of the ocean hints at turbulent depths, an unsettled tattoo that pulls you into its spectacle. The perigee moon, the orbit that brings a full moon closest to earth, coincides with gales, hurricanes, earthquakes and other disruptions that shake things up before they settle back into a new pattern. But a bright moon in a clear sky casts a different path over a calm sea or lake, a tranquil image that highlights the serenity of a moonlit night. In the Tao, water equates to wisdom. A full moon is an archetypal symbol for clarity. A peaceful moon over water signals the deeper level of understanding that lies beneath a luminous surface. Scenes take space so reserve some real estate on your chest, your side over the rib cage or your hip, or the width of your lower back. Hokusai-style tattoo art, interpreted by skilled tattoo illustrators, can include a moon - maybe a beautifully red-tinged blood moon - and great rearing waves capped in white foam. A panorama like this represents investment ink that takes hours to complete over several sessions and could be the focal point of a major collection of body ink, a gallery on your skin. 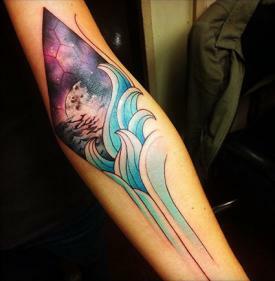 Water's symbolism, coupled with the moon, makes a powerfully evocative tattoo. Water has always stood for renewal, cleansing and purification, transformation and metamorphosis, mystery, the source of life, and a force that could bring about total destruction. Water is sacred, like the heavenly bodies that transfixed ancient peoples. A tattooed ocean complete with a new moon or a partial eclipse of the moon, and a breeching leviathan, might be viewed as magnificent or malevolent, but always as an awe-inspiring image. The moon influences the tides, and women's reproductive systems are linked to moon cycles. 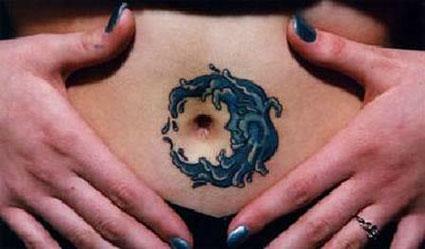 Both the moon and water are considered feminine symbols, one reason water-moon tattoos are favorites of women. The moon itself is seen as a divine presence, a form of the Egyptian goddess Isis, a metaphor for heaven, a focus of worship in ancient cultures. In Greece, Artemis the huntress who rules the tides, is linked with Selene, the moon goddess. In ancient Rome she was known as Diana. The Celts, Hindus, and Chinese all venerated a moon deity. If you're in love with the intimate grace of the moon and water, your water-moon tattoo may hold deep spiritual meaning for you. Kuan-Yin, the Chinese bodhisattva of compassion is depicted in a famous 12th-century Chinese statue called the "Water and Moon Kuan-Yin Bodhisattva." The qualities of "water" and "moon" are significant in Kuan-Yin veneration because they stand for dreams, intuition, soul-knowledge and the truth behind illusion. A Water Moon Kuan-Yin is a rich subject for a full back, with the bodhisattva seated on a lotus leaf floating on splashing waves, a full moon illuminating her head from behind like a halo. A Kuan-Yin seated in the curve of a crescent moon suspended over water is a vertical image to cover an upper arm or a calf. A water scene lit by the moon hints at enigmas and secret depths. A moon formed from water is all rushing energy and fluidity. A goddess floating in a sea of moonlight conveys selflessness and spiritual aspiration. And a barrel wave-crescent moon on a well-defined pec or a tanned pelvic bone might just clue the world to your overwhelming love of surfing, its thrills and its mysteries. However you choose to ink the moon and water on your skin, consider the coupling an affirmation of feminine energy, wisdom, mercy, and your own natural exuberance for life.